This article is about the locality in South Australia. For the nearby bay, see Hardwicke Bay. Hardwicke Bay is a locality in the Australian state of South Australia located on the west coast of Yorke Peninsula overlooking the bay also named Hardwicke Bay about 104 kilometres (65 miles) west of the Adelaide city centre and about 9 kilometres (5.6 miles) north of the town of Warooka. 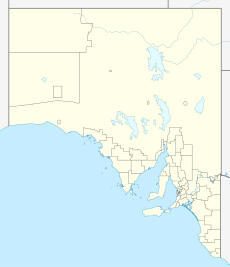 Hardwicke Bay is located within the federal Division of Grey, the state electoral district of Narungga and the local government area of the Yorke Peninsula Council. The 2016 census reported Hardwicke Bay as having a population of 126 people. ^ a b Australian Bureau of Statistics (27 June 2017). "Hardwicke Bay". 2016 Census QuickStats. Retrieved 6 January 2019. ^ a b c d e "Search result for "HARDWICKE BAY (LOCB)" (Record no SA0029357)". Department of Planning, Transport and Infrastructure. Retrieved 1 December 2015. ^ a b c "Hardwicke Bay Postcode". Australian Postcode Finder. Retrieved 4 December 2015. ^ a b c d "New Ward Structure 2014". Yorke Peninsula Council. Archived from the original on 15 January 2016. Retrieved 21 October 2015. ^ "Yorke and Mid North SA Government region" (PDF). The Government of South Australia. Retrieved 17 April 2017. ^ "Summary statistics WAROOKA". Commonwealth of Australia , Bureau of Meteorology. Retrieved 4 December 2015. ^ "Search result for "MOOROWIE SHACK SITE" (Record no SA0046195)". Department of Planning, Transport and Infrastructure. Retrieved 5 December 2015. ^ "Search result for "HARDWOCKE (sic) BAY SHACK SITE " (Record no SA0030679)". Department of Planning, Transport and Infrastructure. Retrieved 5 December 2015. ^ "Development Plan - Yorke Peninsula Council" (PDF). Department of Planning, Transport and Infrastructure. pp. 255–257 & 394–396. Archived from the original (PDF) on 4 June 2015. Retrieved 24 July 2015. This page was last edited on 17 January 2019, at 06:58 (UTC).